B. Thomas (Arlington, Texas, United States) on 3 December 2018 in Landscape & Rural. Sierra Blanca Peak, home to Ski Apache, rises more than 12,000 feet above sea level in south central New Mexico, providing stunning views of the desert lands more than 7,000 feet below, including White Sands National Monument. The resort is owned by the Mescalero Apache Tribe. Two views from my friend's condo - Day 2 and Day 4 of our November trip. I like before and after. Nice and well made interesting collage. They are both excellent. Superb images. 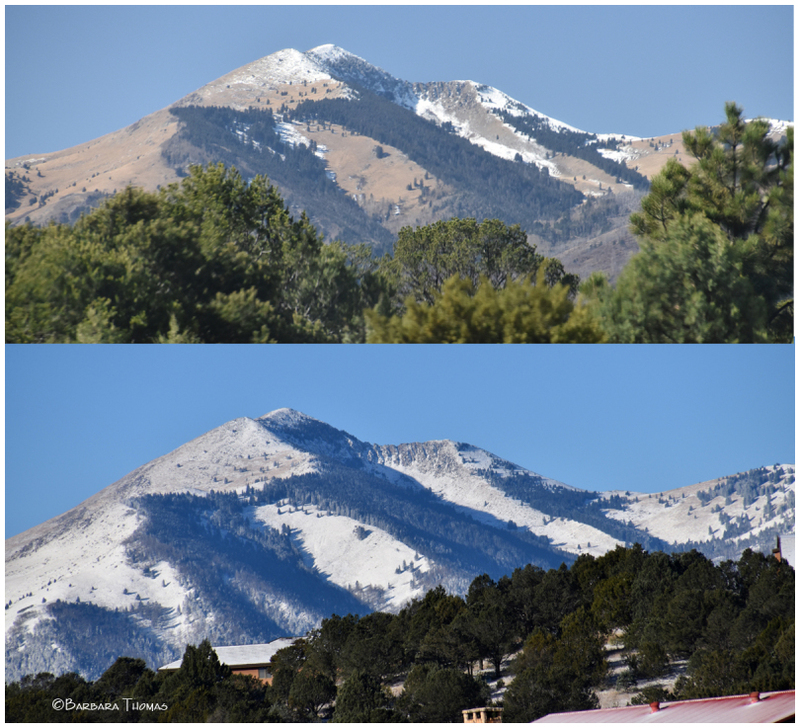 How beautiful these 2 images and what a high in New-Mexico ! I prefer the after. The snow adds a bit of sparkle to the scene. Both are beautiful, but I prefer the latter. Your two photos show what a difference some snow makes. Both photos are very beautiful. I go for nr 2 than with the trees lighter green. What a difference two days make. Lovely comparison. Interesting info together with 2 beautiful photos. A lovely transformation took place. A great way to showcase these comparisons!! The cloudless skies make them stand out nicely! A gorgeous view! I love the snow on the mountain. I like your presentation of the different views ! both beautiful !